Pinnacle Exhaust Cleaner & Brightener removes stubborn dirt and soot from exhaust tips leaving them shiny and protected. This long-lasting formula adds the finishing touch to your perfectly polished vehicle with one easy step. With Pinnacle Exhaust Cleaner & Brightener, you can be sure that your vehicle will be a head turner from top to bottom! Every detailer knows that glossy, smooth paint makes any vehicle look great; detailers with more experience take extra time to dress tires and perfect the clarity of glass; seasoned detailers don�t stop there, they make sure that every inch of the vehicle is detailed to perfection � including the exhaust tips! Pinnacle Exhaust Cleaner & Brightener is the perfect product to keep on hand for eliminating the unsightly soot, road grime, oil, and grease from exhaust tips leaving a mirror shine and a lasting layer of protection. After treatment with Pinnacle Exhaust Cleaner & Brightener, these tips shine like new. 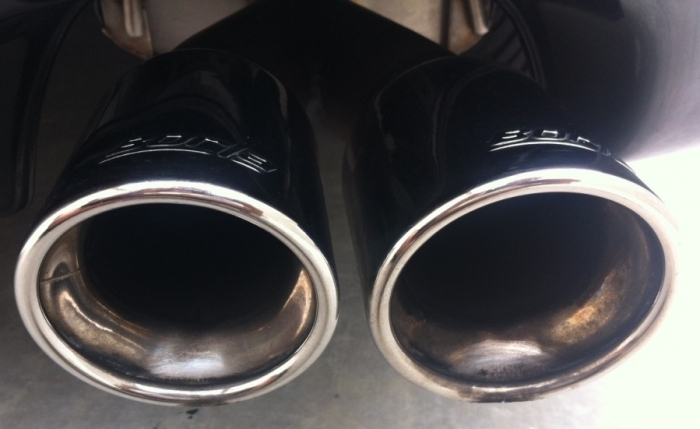 Before treatment, the exhaust tips on a 2007 BMW 335i sedan are dirty, dull, and splotchy. 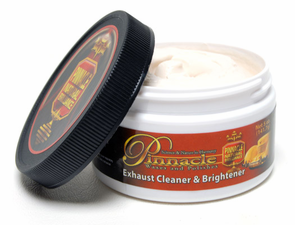 Pinnacle Exhaust Cleaner & Brightener is true to the Pinnacle name offering a high-quality, all-natural formula that is environmentally friendly and safe to use. You�ll especially appreciate the pleasant fragrance! The thick, creamy consistency of Pinnacle Exhaust Cleaner & Brightener makes it easy to work with. Blended with the finest all-natural cleaning agents, diatomaceous clay, and heat-resistant anti-corrosion ingredients, Pinnacle Exhaust Cleaner & Brightener is designed to effectively clean soot buildup, while adding a layer of long-lasting protection. Use Pinnacle Exhaust Cleaner & Brightener on polished, chrome, and bare exhaust tips and mufflers for an unmatched shine and completely detailed look. This was easy to apply and remove, but it did not leave a shine that I had anticipated. 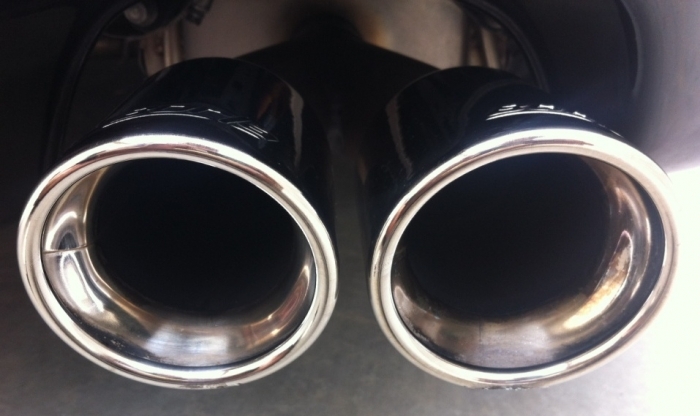 Directions followed and applied to a high-quality after market exhaust system. Results were no better than common cleaner wax. I don't know that the stainless exhaust tip on my diesel truck had ever been cleaned. Let's just say it almost looked matte black with corrosion, soot, and other road grime. Pinnacle Exhaust Clean & Brightener easily cleaned my exhaust of all the grime, soot, and minor corrosion. This product has permanently earned a spot in my arsenal. 58,000 miles, exhaust tips appear to have never been cleaned. Pinnacle worked excellent on the outside. The insides are too far gone (pitting, staining) but it did improve them greatly. Used with Pinnacle's exhaust tip cleaning applicators. This product is simply awesome. It works great and it really brings out the shine of my exhaust tips. It's easy to use and it's so easy to maintain the tips using this regularly. It has a protective coating that works. I have also used this on chrome wheels with great results. Makes cleaning them so easy. ProsEase of use Cleans well Leaves behind a protective coating.